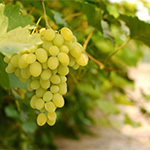 Grapes may be an antidote to high blood pressure caused by too much dietary salt. University of Michigan scientists put rats on high-sodium diets and gave some of them blood pressure- lowering medication, and others powder made from whole grapes. Both groups developed high blood pressure, but the systolic pressure remained lower than in rats that were on a high-salt diet with no medication or grape powder. Those on grape powder, however, showed less heart damage (distortions of size, weight, and function) than those on medication or in the control group. The grape-fed rats also had the lowest levels of markers of inflammation and oxidative damage.